Adapted from janespatisserie.com, eggs appear in two ways in this festive delight. There are eggs in the cookie dough batter as well as Cadbury Mini Eggs folded in and as a decorative topping. Preheat oven to 350F and line a 9×13-inch baking pan with parchment paper sprayed with cooking spray. In a large saucepan over medium heat, melt the margarine/butter. Add the sugars and mix until the sugars are dissolved. Remove from the heat and add the eggs and vanilla, mixing until well combined. In a separate bowl, combine the flour, baking soda, salt and corn meal. Transfer to the saucepan and fold until completely moistened. Fold in 2 cups of Mini Eggs and the white and dark chocolate chips. Press the batter down into the prepared baking pan. Sprinkle the remaining ¾ cup Mini Eggs over the top and gently press down. Bake for 30 minutes and allow to cool before slicing into squares/bars. Preheat oven to 350F. In the bowl of a food processor fitted with the steel blade, combine eggs, 1 1/2 cups sugar, oil, juice and vanilla and mix well. Add to food processor and pulse until dough begins to form. The dough will be very sticky. Remove dough from bowl and place on flour-covered surface. Knead dough until it no longer sticks to surface (add flour as necessary). Separate dough into 1/3 and 2/3 portions. Roll out crust (2/3 portion) to ¼-inch thickness and using the rolling pin, transfer the dough to the bottom of 9-x13-inch pyrex pan that has been sprayed with cooking spray. Trim edges as necessary. Combine apples, ½ cup sugar and 2 tsp. cinnamon in a bowl and place onto crust of pan. Roll out remaining 1/3 portion of dough to ¼ inch thickness and cover the apple mixture, trimming edges as necessary. Gently slice into 40 small squares using a serrated knife to score them and to allow for some venting during the baking process. Sprinkle the entire cake with 1 tsp. cinnamon combined with ¼ cup sugar. Bake for 1 ¼ hours. I doubt that anyone will find a proper version of this cake in any traditional cookbook. Eva is a Holocaust Survivor in her 90s who is an expert cook and baker like no other on food network television shows. I watched Eva make this, took copious notes and still couldn’t make it as perfectly and as easily as she makes it look. I’ve adapted her recipe to make “extra” dough to make this experience more “forgiving.” This is a recipe that needs to be passed on from generation to generation as there is really quite nothing like this delicious homemade apple cake with a cookie dough like crust and topping. Hint: the reason to make it in a clear pyrex dish is so that you can check if it’s done by checking the bottom (Eva’s trick). This amazing chocolate chip cookie adapted from Max’s friend’s grandmother can be done in one bowl in a food processor. You can’t have too many chocolate chip cookie recipes in your repertoire. Preheat oven to 375F and line baking sheets with parchment paper. Cream together the margarine and sugars in the bowl of a stand mixer fitted with the paddle attachment. Mix until light and fluffy; add eggs, one at a time, followed by the vanilla. In a separate bowl, mix the flour, baking soda and salt. Add the flour mixture to the bowl and mix until just combined. Fold in the chocolate chips with a rubber spatula. Chill the dough for 2-24 hours. Use a small ice cream scoop to form portions of dough into round balls. Bake for 10 minutes. Makes approximately 56 cookies. Alternative method: In the bowl of a food processor fitted with a steel blade, combine the margarine, sugars, eggs and vanilla. Process until well combined, approximately one minute. Add the flour, baking soda, and salt and pulse until just combined. Mix in the chocolate chips with a rubber spatula. These fun cookies are from Jessica Merchant’s book, “The Pretty Dish.” I doubled the recipe as she suggested because I knew that two dozen cookies wouldn’t last long in my house. They are oil, rather than margarine-based, allowing the use of several types of oil. I used “Sweetapolita” Sprinkle Medley to make them even more fun. Combine flour, baking powder and salt in a medium bowl and set aside. Beat together the cocoa, sugar and oil in the bowl of an electric mixer fitted with the paddle attachment. Add the eggs, one at a time followed by the vanilla. Slowly add the flour mixture and mix until just combined. Batter will be sticky. Cover with plastic wrap and refrigerate for at least 4 hours. Place the sprinkles into a small bowl. Preheat oven to 350F and line cookie sheets with parchment paper. Using a 3 cm ice cream scoop, form the batter into balls, then dip into the sprinkles. Bake for 12 minutes and allow to cool. Makes 46 cookies. Grapeseed oil is often used in baking and cooking because it has a higher smoke point. Compared to olive oil, it can be heated to a higher temperature before smoking. Try using it as a replacement next time you fry anything! Today’s recipe requires little effort and should be made for any celebration (or for margarita Mondays). Place all ingredients in a blender. Pour blended margarita into a 9×13 pan and freeze. At this point you can drink some of it as a celebration for making it this far. After 3 hours, remove the pan from the freezer and “grate” the frozen margarita with a fork. Spoon into a glass and serve. Alcoholic beverages have a freezing point below that of water (below 0 degrees C). As such, the granita remains partially liquid, because of the alcohol content. These muffins are the best blueberry muffins I’ve ever had. I know this is a serious statement, but I’m not one to say it lightly. This recipe is originally from Smitten Kitchen, however I swapped a few ingredients to make the recipe non-dairy and doubled it (to make 12 XL muffins). You might think it’s insane to add a teaspoon of sugar to the top of each muffin, but I swear its worth it. Don’t worry about the dough being too thick, it is supposed to be (similar to cookie dough) and feel free to use frozen blueberries. I used bakery style (fluted) muffin liners which allowed me to overfill these muffins. Heat oven to 375˚F and line a muffin tin with 12 liners. Put melted margarine, sugar, zest, tofutti sour cream and eggs in a bowl and mix well. Add baking powder, baking soda, salt and flour, mix well. Divide batter between muffin cups (let it be a lot) and add 1 tsp turbinado sugar to the top of each muffin. Bake for 30-35 minutes until the tops are perfect, crunchy and golden brown. These freeze very well and are a great go to muffin recipe. Serve to a crowd or throw them in your lunch to brighten up your day. Tofutti sour cream is made with a mixture of different types of soy including tofu and don’t any contain dairy. However, it still contains a very similar texture to dairy sour cream because of its products such as carrageenan gum, inulin and rice starch. Now it’s my turn to have my hand at the Challah game. This one is adapted from Norene’s Prize Winning Challah. I started making this challah in my second year of university, and it has been a hit! It is super forgiving and doesn’t require any fancy machinery. As for the flour, this can be done with regular best for bread flour however I prefer multi-grain to give it some extra nutrients. I originally found this multi-grain flour (Best for Bread Multigrain by Robin Hood) at Walmart. However, my local Walmart did not have it in stock. After getting a tooth implant the day prior, I spent 2.5 hours hunting around grocery stores and eventually (after calling) found it at Real Canadian Superstore. I reset my phone after making this recipe and lost some of the progress pictures. I apologize for the trouble! Now, for the recipe! Dissolve sugar and honey in warm water in a large bowl. Sprinkle the yeast on top and leave for 10 minutes before mixing. Add oil, warm water, sugar, salt, eggs, and the multi-grain flour. Beat well. Gradually add the remaining flour. The dough should be slightly sticky to the touch. Knead the dough for 10 minutes (or mix all ingredients in the electric mixer with a dough hook) until smooth and elastic. I find I have to add quite a bit of flour to prevent the dough from sticking. Grease a large bowl with canola oil and turn over the dough so all sides are lightly greased. Cover with a cloth and leave in a warm dark place for 1.5-2 hours (I like to use an oven that has been off for at least a couple hours). (Dough may also rise in the fridge; and will last 3 days before shaping and baking). To shape (6 piece bread): Divide dough in half, then divide each half into thirds. Roll out each dough ball into a long strand. Join all strands together at the top and weave the far right strand over the next two strands, under the third and over the last two. Transfer to parchment paper and cover with a towel. Allow to rise for 1 hour. Prepare topping (for streusel mix all ingredients in a bowl). Brush challah with egg wash and then sprinkle with topping. This recipe is easily doubled and and is great for a shabbat dinner or regular Wednesday night (as I had made this challah for). Multigrain bread is made from more than one grain. This flour contains whole grains which is important to consider for their added health benefits. Whole grains are a source of dietary fibre. This extra fibre (compared to white bread) can help lower blood sugars and aid digestion. Whole grains also contain many added minerals and nutrients. 2. Place first 4 ingredients in a food processor fitted with a steel blade. Process until well blended. Add applesauce and pulse until combined. 3. Combine flours and the next 4 ingredients in a separate bowl. 4. Add flour mixture to processor and pulse until just combined. 5. Add the zucchini and pulse until just combined. 6. Add in the chocolate chips and fold in with a spatula. 7. Transfer batter to 9- x 5-inch loaf pan lined with parchment paper and sprayed with cooking spray. What a great way to use zucchini in a low-fat chocolate cake. Shout out to Arielle W. for the suggestion to include this in the blog. This low fat cake is a great way to sneak a vegetable into a dessert. I’ve been making this for years but brought back, tweaked a bit and now results in delicious perfection. Freezes well. Zucchini is low in calories and is actually classified as a fruit! Also called a courgette, it keeps you full while being very low in calories. It may also protect the cardiovascular system. It is a good source of vitamin C, an antioxidant and it contains Manganese, which is an essential mineral. A Double Feature: Festive Round Rosh Hashana Challah and Apple Crumb Cake! Last year, I purchased a beautiful cookbook, “Breaking Breads,” written by the Israeli author/chef/owner of Breads Bakery (NYC) and Lehamim Bakery (Israel). The cover photo inspired me to bake his challahs for the Jewish New Year, Rosh Hashana. I bake them with a 3-inch (9cm) ramekin in the middle in order to retain the shape. The challah can be served with honey in the ramekin for easy separating and dipping. The recipe below is an adaptation of the original and makes 2 round challahs. Pour the cool water into the bowl of an electric mixer fitted with the bread hook. Add the yeast and whisk into the water. Add the flour, eggs, sugar, salt and oil. Mix the dough on low speed to combine the ingredients, scraping the bowl as necessary. Increase the speed slightly and knead for about 4 minutes until a smooth dough forms. Transfer the dough to a lightly floured surface and knead for about a minute by stretching the dough, then round it into a ball. Lightly oil a large bowl and sprinkle with a little flour; place the dough in the bowl and sprinkle with a little more flour and cover the bowl with plastic wrap. Set it aside for about 40 minutes at room temperature or until the dough has risen by about 70%. Transfer the dough to a lightly floured surface and gently pull the dough into a rectangular shape. Use a bench scraper or sharp knife to divide the dough into 2 equal pieces. Then divide each piece into 3 smaller equal parts crosswise so you end up with a total of 6 pieces. Set a piece of dough lengthwise on your work surface and use the palm of your hand to flatten the dough into a flat rectangle; then fold the top portion over and use your palm to press the edge into the flat part of the dough. Fold and press 3 more times-the dough will end up as a cylinder about 7 inches long. Set aside and repeat with the other 5 pieces. Gently roll each cylinder back and forth to form a long rope about 12-14 inches long with tapered ends. Repeat with the remaining 5 cylinders. Lightly flour the long ropes. Pinch the ends of 3 ropes together at the top, braid the dough, lifting each piece up and over so the braid is more stacked than it is long, making it fatter and taller in the middle. When you get to the end of the ropes and there is nothing left to braid, join both ends of the challah together to form a circle around the oven proof ramekin/bowl. Repeat with remaining 3 pieces of dough. Place the challahs on parchment paper-lined rimmed sheet pans, cover them with a kitchen towel, and set them aside in a warm, draft-free spot to rise until the loaves have doubled in volume, about 40 minutes. Preheat the oven to 400F with racks in the upper-middle and lower-middle positions. To make the egg wash, mix the egg and water together in a small bowl. Gently brush the surface of the loaves, taking care not to let it pool in the creases of the braids. Generously sprinkle the loaves with the seeds. Bake at 400F for 15 minutes then rotate pans and bake for another 15 minutes, covering the challahs loosely with aluminum foil for the last 5 minutes to prevent excessive browning. Remove the loaves from the oven and set them aside to cool completely on the sheet pans. Fill the bowl with honey and enjoy. Best wishes to all for a sweet Shana Tova from www.thescienceofbaking.ca! My friend, Elaine, gave me a recipe for a Blueberry Crumb Cake (possibly a future post) and for Rosh Hashanah I modified it to become an Apple Crumb Cake. This cake is prepared in a loaf pan, freezes well, and is a wonderful accompaniment for a Rosh Hashana or Sukkot dinner. Feel free to use any kind of apple but I prefer Granny Smith as they are a bit tart, retain their texture and shape in baking, and this recipe is quite sweet to begin with. This cake represents simplicity as it isn’t an ornate festive cake but it tastes absolutely delicious. Preheat oven to 350F and line a 9×5-inch loaf pan with parchment paper and spray with cooking spray. In the bowl of a food processor fitted with the steel blade, add the eggs, 1 cup granulated sugar, oil, orange juice and vanilla and mix until well combined. This can also be done by hand (says Max who has made the blueberry crumb cake at school without an electric mixer). In a separate bowl, whisk together the baking powder, 1 3/4 cups flour and salt. Add to food processor and pulse until just combined. Toss the diced apples with the lemon zest, lemon juice, 1 tsp. sugar, 1/2 tsp. cinnamon and 1 tbsp. flour. Fold in the apple mixture with a spatula. Pour batter into the loaf pan and sprinkle with the combination of brown sugar and cinnamon. In celebration of the new year, our facts surround apples and honey. Apples are rich in phytochemicals. They have been linked to a decreased risk of cancer, cardiovascular disease and asthma. Maybe an apple a day does keep the doctor away! Honey on the other hand is often used as a cough suppressant to soothe the throat. Clearly this is meant to be a healthy holiday. 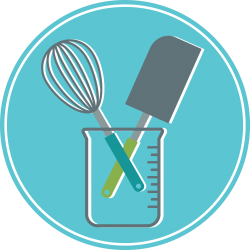 Welcome to The Science of Baking, a father & son baking laboratory. With our science backgrounds we both approach baking on chemical grounds. This site is a place for us to post original and adapted recipes. We hope you enjoy! It’s that time of year! Try our normal hamentshen, or a secret hack that uses cake mix!